Anti-seizure medications for example, can produce drowsiness, fatigue, behavioral changes, and more. ADD/ADHD medications on the other hand can cause nervousness, agitation, anxiety, sleep problems, nausea, vomiting, and other side effects. It’s not uncommon for some children dealing with these conditions to use multiple medications at a time, sometimes just to manage the side effects of another medication they may be taking. CBD on the other hand serves as a natural alternative with no side effects. According to the Association for Anorexia Nervosa and Associated Disorders (ANAD), a staggering 30 million people across the U.S. suffer from an eating disorder. This statistic applies to all ages, race, and genders, although it is mostly seen in females. The statistics surrounding anorexia from there do not get any better, and in fact, they are pretty horrifying, with eating disorders holding the highest mortality rates of any other mental illness, it stands to reason that people are now looking to potential alternative treatments for the disease. CBD can help to treat the worst symptoms of anorexia without causing toxicity, or any other feelings of loss of control that can come with marijuana. The researchers discovered that CB1 agonists – the scientific term to describe anything that helps trigger the receptor – possess orexigenic effects, which enhance appetite as well as increasing the actual rewarding value of food. It’s important to remember that a person suffering from anorexia doesn’t just not want to eat food, but they lose the positive association we have when we eat food that nourishes us. When it comes down to it, both CBD and cannabis as a whole can be incredibly effective treatments for anorexia and other eating disorders. However, that being said there are many areas where CBD comes out on top, from psychoactive THC through to affordability and efficacy in the treatment of symptoms. Cannabidiol (CBD) is not psychoactive. One of the most crucially important qualities of CBD is its lack of psycho-activity. In layperson’s terms, this means that cannabidiol wont get you high. Unlike THC, the cannabinoid with the legendary power of producing euphoric sensations, Cannabidiol CBD is inert. CBD derived for the HEMP plant(male cannabis plant) is completely LEGAL, where CBD derived from the Cannabis plant (the female/bud producing plant) is currently still illegal in Canada. Technically speaking, it’s THC, the cannabinoid that gets you high, which is illicit. The rules governing hemp are quite different from the restrictions placed on cannabis. Organa possesses an active business license because all of our products contain the legal amount of THC (0.3% or less per bottle/package). Cannabinoids, such as CBD, attach themselves to specialized receptors in the brain and immune system. Researchers found that when CBD enters the body it can attach to CB2 receptors. Scientists believe CBD affects the way that these receptors respond to the signals that they recieve, helping reduce inflammation and pain. CB2 also plays a role in your immune system, attacking the tissue in your joints. This relationship tp the immune system could explain why CBD oil works well for Arthritis. In addition, CBD’s anti-inflammatory effects could also help slow down or stop the progression of RA/OA, which causes permanent damage to your joints over time. These effects also reduce several other inflammation-related RA/OA symptoms. Cannabis-research firm, Brightfield Group, surveyed 2,400 users. This dramatic study found widespread satisfaction with CBD among regular consumers, and even revealed that 42% of those surveyed had given up pharmaceutical drugs in favour of CBD. CBD oil helped reduce inflammatory pain in rats, highlighting that cannabinoid receptors are involved in joint nociception and may be advantages for the treatment of inflammatory pain. A research review published in the European Journal of Neuroscience noted that increasing evidence from preclinical studies supports the therapeutic value of cannabinoids for osteoarthritis management. A study published in the European Journal of Pain found that topical CBD application had therapeutic potential for relief of arthritis pain-related inflammation and behaviours. General CBD research is in its infancy, so research on CBD for fibromyalgia could be considered embryonic. We just don’t have much to go on right now. A 2016 survey of the literature concluded that there’s not enough evidence to recommend any cannabis-based treatments for fibromyalgia or other rheumatic conditions. However, this topic is likely to get a lot of future attention, for several reasons. First, we have a pain epidemic in the U.S., and fibromyalgia is a major contributor to that. Current treatments just aren’t good enough for most of us, so there’s an enormous financial incentive to find something that’s better at relieving our pain and other symptoms. Second, we have an opioid addiction and overdose epidemic in this country. Numerous studies have demonstrated that when a state legalizes marijuana, the number of opioid prescriptions drops. That’s good news for doctors looking for safer pain treatments, law enforcement agencies struggling to control the tide of illegal opioid use, and lawmakers looking for solutions to the opioid problem. Third, CBD oil is believed to be effective against pain and inflammation, and, in its pure form, it’s generally regarded as safe. Fourth, while anecdotal evidence certainly isn’t scientific proof of anything, we have an abundance of it from people with fibromyalgia who say CBD helps them, and you can bet that when patients who have hard-to-treat conditions tell their doctors something works, it piques their interest. When it comes to fibromyalgia symptoms, those three are significant. A 2017 paper published in Expert Opinion on Therapeutic Targets suggested CBD as a possible way to diminish the activity of brain cells called glia, which leads to central sensitization. That’s a major feature of fibromyalgia and other central sensitivity syndromes such as chronic fatigue syndrome, irritable bowel syndrome, and migraine. Fibromyalgia also involves something called endocannabinoid deficiency. That’s the system that deals with your body’s natural endocannabinoids as well as cannabis products that you may take in. That makes cannabis products a promising treatment. Several studies have suggested that CBD can fight inflammation. Fibromyalgia isn’t currently classified as an inflammatory condition, but research suggests that at least some cases may involve inflammation of a body-wide web of connective tissue called the fascia. If that’s accurate, it could be one more reason CBD should be considered. CBD oil – derived from cannabis plants – is gaining status around the world; but its pain-relieving, mood-boosting properties have serious research to back it up, and could help relieve period-related symptoms. Cannabidiol, or CBD, is making headway in the natural health and wellness world, mainly due to the growing list of health benefits, including relief from PMS. It’s an active compound found in cannabis, but don’t let it’s association with marijuana scare you. You won’t get the mind-altering high because it contains little to none(0.03%) of the psychoactive component, THC (Tetrahydrocannabinol). Instead, the oil, which is extracted from the cannabis plant and mixed with carrier oils like almond, coconut, and olive, has been shown to help with pain relief. As a result, many women are turning to CBD specifically for PMS symptoms. What’s more, it can be helpful treating cramps, too. CBD can be immensely helpful in treating the irritability and discomfort that comes during the premenstrual phase of our cycles. Because it has strong anti-inflammatory properties and is also a muscle relaxer, it can help with the overall tension, as well as menstrual cramps that can come later. How does CBD oil fit in to this? Well, interestingly, researchers have found that taking CBD oil promotes the body’s own internal cannabinoids to function more effectively – helping to reduce stress and inflammation within its own cells. And whilst further research is needed into applications for women’s health specifically, scientists have found that those who suffer from endometriosis also have low levels of cannabinoid receptors, leading experts to suggest that CBD oil could offer relief from the condition. All this comes with a note of caution that as yet the research into CBD is not complete; while there have been lots of anecdotal evidence around the use of CBD for PMS symptoms, and some preliminary research into pain relief, there have not yet been double-blind, placebo-controlled studies into the topic, and it’s important to check with your doctor, qualified nutritionist or herbal medicine practitioner first that CBD is right for you. The current research, while not explicitly focused on PMS, certainly seems to suggest that if you’re looking for something natural and effective for your PMS tool belt, it’s worth a shot. Every day, there are more studies about the potential medical and daily wellness applications for CBD (and cannabis in general), whether to treat particular medical conditions or to help improve your emotional, physical, and mental health. Of course, these new studies are often confirming the anecdotal, lived experiences of many cannabis-savvy consumers. Have you ever experienced heartburn after finishing a meal or eating spicy food? Have you ever felt heartburn or chest pain at all? Currently, 1 in 10 Americans experience GERD (Gastroesophageal Reflux Disease), which is most closely linked to the symptoms of heartburn. GERD and its symptoms, such as heartburn, can be painful and uncomfortable. Although pharmaceutical drugs are often used to treat GERD, cannabidiol is slowly emerging as a way to help treat this disease safely and effectively. Gastroesophageal Reflux Disease refers to the stomach and esophagus and the return of the contents back up to the esophagus. In normal digestion, the lower esophageal sphincter (LES) opens to allow food to pass into the stomach and closes to prevent food and stomach acid from flowing back into the esophagus. GERD, then, occurs when the LES is weak or inappropriately relaxes allowing the contents of the stomach to flow up into the esophagus. 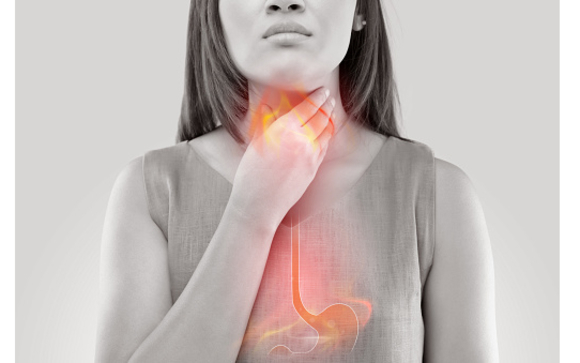 The “heartburn” is the discomfort experienced by the reflux of stomach content to the esophagus. Normally, the treatment is prescription medication or over-the-counter drugs. However, many prescriptions cause adverse side effects. Fortunately, CBD and cannabinoids can be used to combat GERD symptoms. Just as everybody has a lower esophageal sphincter, and potential to experience GERD, each body contains an endocannabinoid system (ECS). ECS has many known functions including memory, sensations, pain perception, anti-secretory effects, etc. One of the most particular symptoms that CBD helps to regulate is the secretion of gastric acids to the esophagus. By reacting with the endocannabinoid system, CBD has the power to greatly reduce the secretion of the acids that cause the actual burn when it comes to the heartburn symptoms of GERD. Beyond this, CBD and the ECS help to mitigate inflammation and mucosal damage in GERD, as well as lower esophageal relaxation, helping to prevent the severity of GERD, or stop it before effects begin to take place. These are just a few examples of how CBD reacts to the gastric acid and intestinal secretions when it comes to GERD. CBD also has positive effects on other factors of the body that contribute to acid reflux and heartburn. CBD has the power to act as an anti-inflammatory to reduce esophageal discomfort and decreases the motility, or the ability for fluids to move around, in the esophagus and the gut which is the direct cause of the acid reflux. With decreased mobility and the reduction in inflammation, the main discomforting symptoms of GERD are treated. If you experience heartburn, acid reflux, or GERD, try observing the foods you eat because they may be worsening GERD symptoms, especially caffeine and alcohol. However, above all else, CBD plays an essential role in treating GERD and its symptoms. If you’re interested in trying CBD, it’s suggested to consume it orally or sublingually with capsules or tinctures to prevent further irritation from occurring. Until recently, evidence has been (more or less) inconclusive, with findings going both ways. These studies, however, had been investigating cannabis flower with no control for strain, cannabinoid profile, or means of ingestion. These findings build upon previous research that shows CBD is a vasodilator, which means it makes your arteries and blood vessels wider, allowing for greater blood flow with less pressure. There is a growing body of medical research showing that CBD’s neuroprotective effects are beneficial for cardiovascular diseases, especially in recovery from stroke and heart attack.